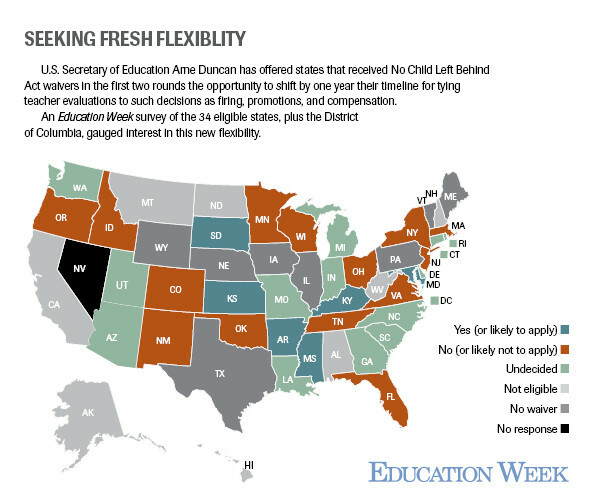 In the wake of U.S. Secretary of Education Arne Duncan's offer to shift the teacher-evaluation timeline by one year for waiver states, Politics K-12 decided to survey all of the eligible states to see if they plan to apply for this new flexibility. The takeaway? Most are undecided, but a sizable number of states—or 14—say they don't need or want the flexibility, for a variety of reasons. Some, such as those headed by members of Chiefs for Change, believe any delay is a delay in accountability. Other states, such as New York, Colorado, and Tennessee, told us they won't pursue it because their timelines are set out in state law or regulations. States that are likely to apply for this additional flexibility, which would delay the use of personnel decisions linked to new teacher evaluations until 2016-17, include Arkansas, Kansas, and Maryland. You can see the state-by-state breakdown in the (updated) map below. Remember that only states that received waivers in the first two rounds are eligible for this timeline shift.